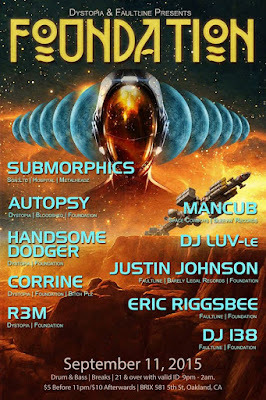 Faultline: next event: Foundation - Friday Sept. 11, 2015 - with Mancub and Submorphics! next event: Foundation - Friday Sept. 11, 2015 - with Mancub and Submorphics! Dystopia and Faultline have come together to provide for you an unprecedented party experience in the heart of downtown Oakland’s newest venue. 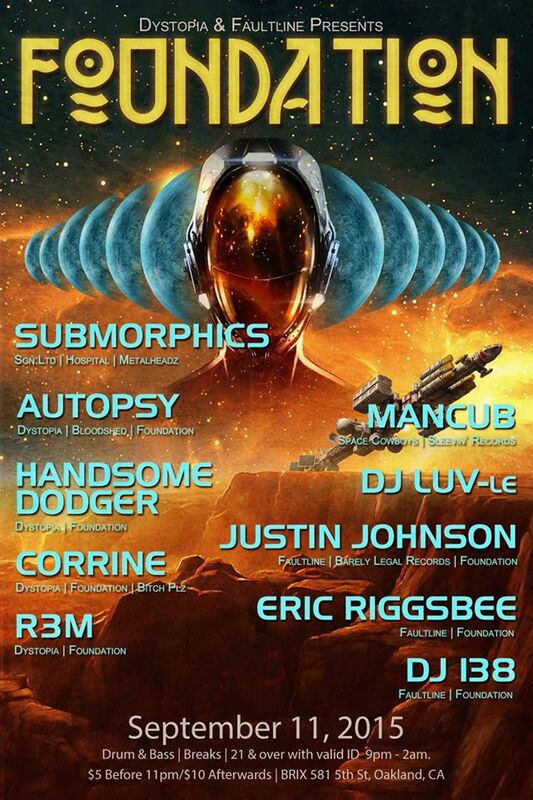 Dystopia is Oakland’s premiere Drum & Bass monthly every 4th Friday at Lounge 3411. Faultline is Oakland’s premiere Breaks crew consisting of some heavyweight veterans. Our communities have joined forces to create memorable nights of auditory satisfaction. Foundation 2.0 is here and now will occur at BRIX 581 every 2nd Friday of the month. Submorphics (Greg Axelrad) has made his name with soul-drenched, deep, emotive, nostalgic yet forward-thinking music. Starting from the very bottom, Submorphics eventually rose through the ranks of the DnB scene, now releasing on only the top labels in the genre: Shogun Audio, Hospital, Liquid V, Innerground, Good Looking, Spearhead; etc. Anthems such as "Summer Soul," "Organ Grinder (Calibre Remix)," "Higher Ground ft. T.R.A.C," "Burning Love (orig + Lenzman Remix)" and "Long Been Gone" have seen extensive play on BBC Radio 1 and clubs worldwide. Drawing on eclectic influences from his formative years in Detroit and Chicago, Submorphics' sounds have been heavily supported by a who's-who's list of A-list DJs, yielding praise from both sides of the Atlantic. Now based in San Francisco, Submorphics continues to relentlessly complete new music, always stepping up his game, while touring the US and Europe as much as possible. As a DJ, Submorphics sonically alloys disparate styles; the grimy and the smooth, the hypnotic and the astonishing. It is hard to nail his style down, most would say “funky, sometimes nasty”. Chip “Mancub” Corwin is currently voted as a top ten dj of San Francisco.He has been blowing up the block party jams for over ten years. Mancub has a very diffinitive style of turntable tricks that have earned him slots beside some of the dance industry’s biggest headliners. His turntable antics are too numerous to mention but include scratching while wearing boxing gloves, he certainly knows how to work the crowd into a frenzy! !You can hear his mixes on the internet radio station pulseradio.net, netamp.com or djmancub.com. The netamp show is aired on the last Wednesday of the month or archived. Mancub also plays for the infamous playa posse The Spacecowboys, ripping up a rare storm on the mighty Unimog at numerous unforgettable party’s. Mancub has recently joined Sleevin records and is supporting us in a big way. Look out for future singles and remixes of his work on the label. DJ LUV-le is a sound engineer, video artist, DJ, music maker, and dreamer who seeks to observe, transfer, invent, and manipulate sound in various mediums and environments. You can catch her live on her radio show on http://party934.com/ every Wednesday night from 10pm-12am. She's stoked to bring the bass for your booty and the breaks for your face at Foundation!